Dual-cure, self-adhesive resin cement designed for luting of all-ceramic, metal and composite indirect restorations. Creates an exceptionally high bond durability to zirconia, while the unsurpassed wear resistance and color stability give peace of mind when luting CAD-CAM and metal-free restorations. Easy clean-up of excess cement after 2-second tack cure. Convenient, double-barrel automix syringe. Contains: 2 x 4.6g dual syringes, 15 automix tips, 5 automix endo tips. Contains: 10 automix tips for endo and 10 extension tips. G-CEM LinkAce was used by 26 consultants in 491 cases. Product received a 93% clinical rating. 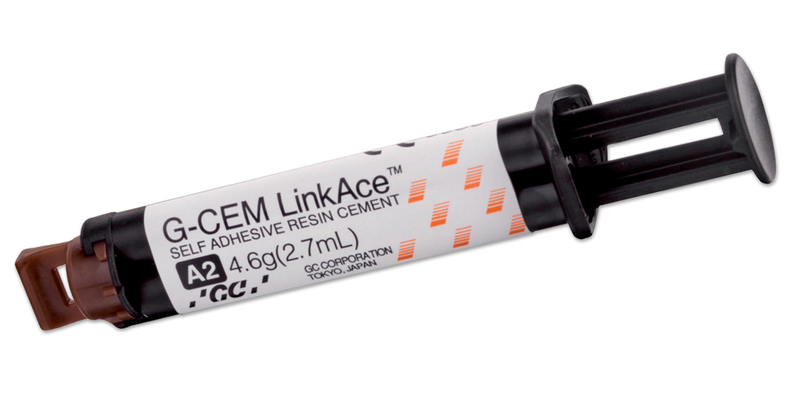 G-CEM LinkAce is a dual-cure, self-adhesive resin cement delivered in a double barrel automix syringe. It is indicated for cementation of all-ceramic, resin and metal-based crowns and bridges, inlays, onlays and posts. Offering the highest polymerization in self-cure mode, G-CEM LinkAce provides reliable results, regardless of the type of prosthetic material that is being cemented.G-CEM LinkAce contains proprietary phosphate monomers which ensures bonding to zirconia, as well as CAD-CAM and metal-free restorations. Working time is 3:30. Tack curing of margins is recommended, followed by removal of excess cement. Final self-curing occurs in 4 minutes, or the product may be light cured for 20 seconds per surface. The syringe delivery and automix dispensing of G-CEM LinkAce were easy to use and provided a homogeneous mix. The viscosity allows complete seating of posts and restorations. Excess cement was easiest to remove after a short tack cure. Fully set cement is difficult to remove. Consultants reported it was important to maintain pressure on the restoration during the setting time. 23% of consultants rated G-CEM LinkAce better than other self-adhesive resin cements they were using and 54% rated it to be equivalent. 62% would switch to G-CEM LinkAce and 81% would recommend it to a colleague.